I'm in the process of adding a 2TB hard drive to my home server, mainly for backups and archives. 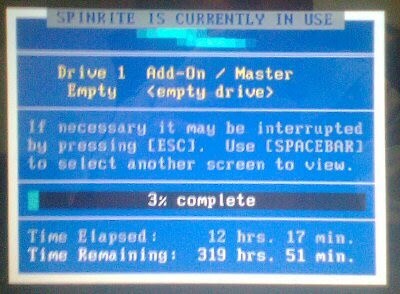 So before I format the drive I decided to run SpinRite in maintenance mode to check that the drive is OK.
Update: I ran SpinRite in "Emergency Recovery Mode" and it completed the job in around 5 hours. Now I'm formatting the drive, and I'm curious to see how long that takes. It also took around 5 hours to do a proper format of the drive. I have copied around 1TB of backup files onto the drive, and it took most of the weekend to do. 2TB is a lot of data!